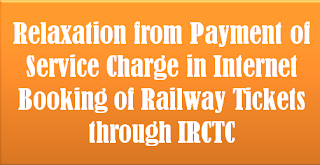 Railway Board (Pay Commission Dte.) vide their letter No.PC-VII/2016/1/7/2/1 dated 11th November, 2016 (RBE 131/2016) had communicated payment of DA @ 2% per month to all categories of Railway Employees w.e.f 1st July, 2016. 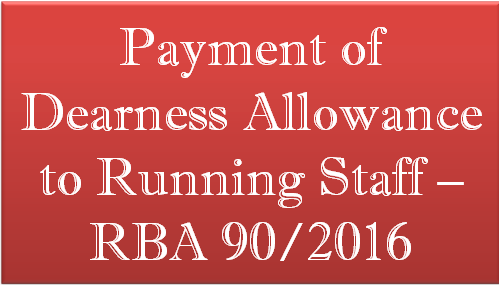 The issue regarding admissibility of DA on running allowance paid to Running Staff has been examined in this Ministry and it has been decided that DA @ 2% shall be admissible to Running staff on the Basic pay plus Running allowances drawn w.e.f 1st July, 2016. 2. 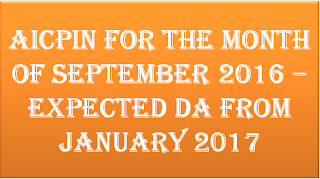 CRIS may incorporate the above rule in IPAS application, so that payroll of running staff for November, 2016 could be drawn accordingly. 3. It may please be ensured that Salary Advance of Rs.10000/- paid to Non-Gazetted employees in terms of Railway Borad’s letter No.2016/E(LL)/APW/1 dated 17.11.2016 is recovered from the concerned staff in salary bill of November 2016. 3. The issues with the approval of competent authority. Subject: Agitational Programme to be held from 05.12.2016 to 09.12.2016. It is hoped that all of you are well and busy in accelerating trade union activities. Under the banner of Government Employees National Confederation, we continuously demanded for removal of anomalies related to pay fixation, bonus, income tax, recommendations of Pay Commissions but the Governments did not pay any heed to our genuine demands and it is leading discontentment amongst the employees. Therefore, Government Employees National Confederation has decided that all the constituent Federation of GENC will observe an agitation programme throughout the country from 05.12.2016 to 09.12.2016. 1. Minimum Pay should be fixed Rs 24,000/- and fitment formula should be 3.42 in place of 2.57. 2. Under MACP Scheme, 05 financial upgradation should be granted in promotional hierarchy in the service of 30 years. 3. Annual Increment should be @ 5% in place of 3%. 4. The Benchmark ‘very good’ should be abolished for granting of promotion, financial upgradation and annual increment. 5. The Grade pay of Group ‘C’ Rs 1900/- and Rs 2000/- should be merged and upgraded to Rs 2400/-. 6. HRA should be paid @ 35, 25 and 15% of pay. 7. New Pension Scheme should be scraped. 8. FDI should be scraped in Defence and Railway. 9. Bonus should be calculated on Rs 18,000/- in place of 7,000/- because minimum pay has been enhanced from 7,000/- to 18,000/-. 10. Income tax exemption limit (tax free income) should be extended to Rs 8,00,000/-. 11. The wards of employees died in harness should be guaranteed with 100% compassionate ground appointments. With due regards, your attention is invited to power point presentation in the meeting held on 18.11.2016 under the chairmanship of Defence Secretary on the allowances payable on the recommendations of 7th CPC. (a) Caretaking Allowance (Para 8.3.20) at the rate of 10% of Basic Pay is being paid to Group ‘C’ Staff. Now 7th CPC has recommended for 2% of Basic Pay per month. It is demanded that this Caretaking Allowance should also be admissible to Defence Civilians performing the similar duties. 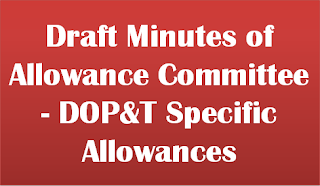 (a) Professional Update Allowance (Para 8.4.7): This allowance should be extended to Group ‘A’, ‘B’ & ‘C’ incumbents engaged in Ordnance Development Centre (OFB), Group ‘B’ & ‘C’ of DRDO and Laboratory Technicians in Pathology of Govt Hospitals. (a) Holiday Monetary Compensation (Para 8.6.6): Group ‘B’ Gazetted Supervisory Staff (Junior Works Manager) in Ord Fys have to work on Sunday and other holidays. This allowance should be extended to this Cadre also. (a) Air Worthiness Certificate Allowance (Para 8.9.5): At present this allowance is being paid to Technical Tradesman in Aircraft trade @ Rs. 225/- to 450/- per month. But their Civilian counterparts are not granted this allowance. This should be looked into. 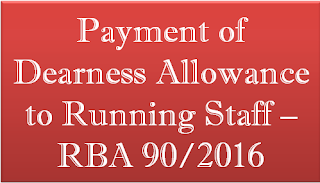 (a) Boiler Watch Keeping Allowance (Para 8.10.7): Presently it is admissible to Boiler Watch Keepers on Naval Ships @ Rs. 3000/- per month. Similar nature of work is performed by the Boiler Attendants of Ord Fys. Hence, this allowance should be admissible to Boiler Attendants of OFB. This allowance is granted to Defence, CAPF and Indian Coast Guard. Civilian counterparts of Ministry of Defence should also be granted the Field Area Allowance. This allowance @ Rs. 240/ per month is granted to Staff Nurse in Central Government Hospitals, who work in ICU/Operation Theatre. This federation is not agree with the 7th CPC’s recommendation (Para 8.10.80) to abolish this allowance as the amount is meagre rate. Hence, this allowance should be continued and enhanced. It is granted to Naval Artificers and Mechanicians for the period they are deployed for submarine maintenance duties. The present rate is ₹300 pm. Civilian counterparts of Navy should also be granted this allowance. (a) Daily Allowance (Para 8.15.15): The 7th CPC has recommended for reimbursement of Travelling Charges for Level 5 and below at the rate of Rs. 113 per day. This is very meagre amount. Hence, it should be enhanced to Rs. 200 per day. 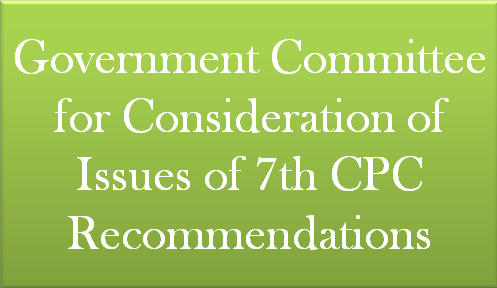 The 7th CPC has recommended for ‘reimbursement of charges on transportation of personal effects’ at the rate of Rs. 25 per km for Level 5 and Rs. 15 per km for Level 4 and below category. It is not understandable how a transporter will discriminate among the employees of different categories for rate for transportation by road. Hence, it is demanded that the rate for transportation by road should be equal for all categories of employees. This is submitted for your kind consideration and necessary action. (f) if not, the reasons therefor? (a) to (c): In pursuance of the assurance given by the Union Ministers to the representatives of the National Council (Staff Side), Joint Consultative Machinery, meetings have been held by a group of senior officers with them to discuss their demands in this regard. (d) to (f): The Committee on Allowances has been interacting with various stake-holders to discuss their demands and has so far held discussions with National Council (Staff Side), Joint Consultative Machinery, representatives from staff associations and officials from Ministry of Health & Family Welfare, Ministry of Home Affairs and Department of Posts. The Committee may also interact with the representatives of some other major Ministries/Departments and stakeholders with whom consultations are yet to be held before finalizing its Report. 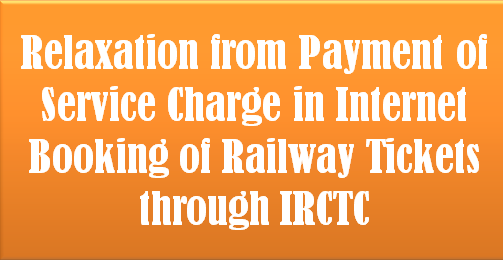 Ministry of Railways has decided that in order to help passengers and incentivise the payment through credit/debit/cash cards instead of cash payment for booking of reserved tickets, Service Charge shall not be collected on booking of e-tickets/ i-tickets from 23rd November to 31st December, 2016. Service Charge is Rs. 20 on sleeper/ 2nd Class and Rs. 40 on AC classes for booking through IRCTC. The Department of Personnel & Training collects online data about the representation of persons with disabilities in the posts/services in Central Government Departments/Ministries. As per information received from 71 Ministries/Departments, there were 16,304 persons with disabilities in the Central Government Ministries/Departments as on 01.01.2014 and 20,570 persons with disabilities as on 01.01.2015 as per information received from 59 Ministries/Departments. 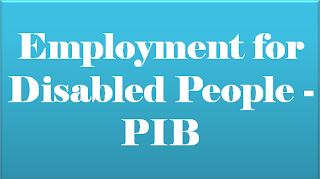 By virtue of Entry 9 of State List of the Constitution of India, the respective States are required to implement the provisions relating to reservation for person with disabilities in their establishments. Therefore, data on official figures of employed disabled people in the States/ Union Territories are to be maintained by them. 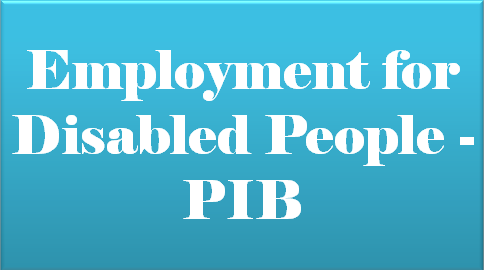 The Department of Empowerment of Persons with Disabilities has requested States/Union Territories from time to time to implement Section 33 of Persons with Disabilities (Equal Opportunities, Protection of Rights and Full Participation) Act, 1995 which mandates 3% reservation in vacancies for persons with disabilities in establishment. In the Conference of States/Union Territories Social Welfare Ministers/ Secretaries/Administrators in-charge of Disability affairs dealing with empowerment of persons with disabilities held on 02.06.2016, States/Union Territories were urged to draw a mechanism to have consolidated data on employment of persons with disabilities in the State establishments. (d) the timeframe drawn for the Committee to submit its report to the Government and the date from which the allowances including house rent, education and transport allowances are likely to be made effective? 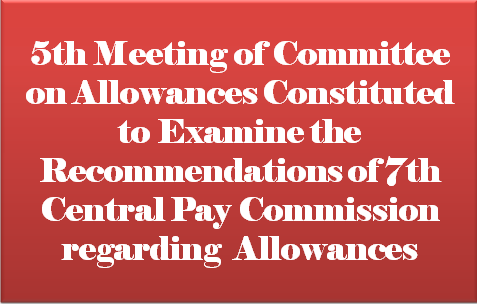 (a) & (b): In view of the number of representations received with regard to substantial changes with the existing provisions relating to Allowances recommended by the 7th Central Pay Commission, the Government has set up a Committee to examine the recommendations of the Commission on allowances (except Dearness Allowance). The Committee has been asked to go into the recommendations of the Commission on various allowances and, having regard to the representations made by the staff associations as also the suggestions of the concerned Ministries/Departments and to make recommendations as to whether any changes in the recommendations of the Commission are warranted and, if so, in what form. 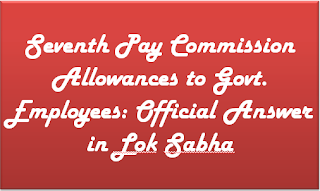 Till a final decision is taken by the Government based on the recommendations of this Committee, all allowances (except Dearness Allowance) will continue to be paid at existing rates in the existing pay structure. The Committee, constituted vide order dated 22.7.2016, is to submit its report within four months. (c) & (d): The Committee has been interacting with various stake-holders to discuss their demands and has so far held discussions with National Council (Staff Side), Joint Consultative Machinery, representatives from staff associations and officials from Ministry of Health & Family Welfare, Ministry of Home Affairs and Department of Posts. The Committee may also interact with the representatives of some other major Ministries/Departments and stakeholders with whom consultations are yet to be held before finalizing its Report. On submission of the Report, the matter pertaining to allowances will be considered by the Government and appropriate decision will be taken thereafter. 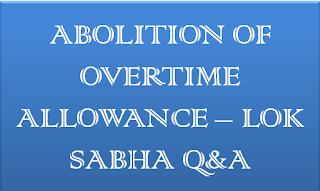 whether the Government is considering to abolish overtime allowance in Government offices and if so, the details thereof? Yes Sir. The expenditure of Rs.796.90 crore in 2006-07 was excluding the expenditure on overtime allowance in respect of employees of Union Territories whereas the expenditure of Rs. 1629.02 crore during year 2012-13 is including the expenditure in respect of employees of Union Territories. The Seventh Central Pay Commission has recommended to abolish OTA (except for operational staff and industrial employees who are governed by statutory provisions) and in case the Government decides to continue with OTA for those categories of staff for which it is not a statutory requirement, then the rates of OTA for such staff should be increased by 50 percent from their current levels. 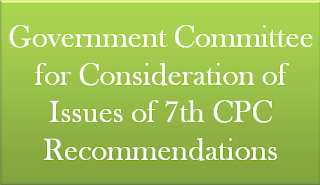 Recommendation of the 7th CPC on allowances are yet to be finalised. 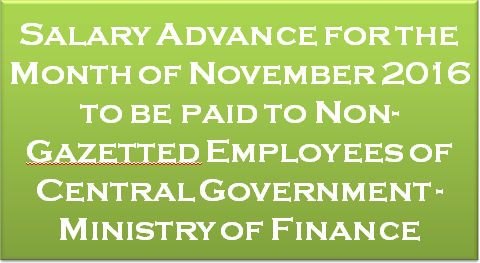 Subject: Salary advance for the month of November 2016 to be paid to Non-Gazetted employees of Central Government. In terms of Rule 64 (2) of Central Government Account (Receipt & Payment) Rules, 1983, the President is pleased to release part salary, in advance, amounting to Rs. 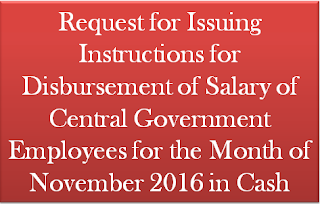 10,000/- (Rupees ten thousand) by 23rd November 2016 from the salary for the month of November 2016 in the form of cash payout to all Non-Gazetted employees of Central Government. 2. 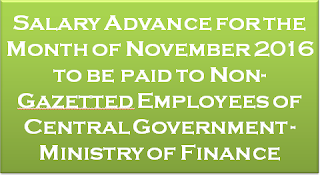 Employees, who do not wish to receive the cash pay-out of the part salary advance amounting to Rs.10,000/- (Rupees ten thousand) may give their option in the enclosed proforma to their respective Drawing & Disbursing Officer by is 18th November 2016. In that case, their salary will be credited to their account on the last working day of November 2016, as usual. In case no option is received by the said date, it will be presumed that the employee has opted for cash pay-out and the payment thereof will be disbursed in cash accordingly. Residual part of their salary payable for the month of November 2016 will be released as per the existing procedure. 3. The contents of this Office Memorandum may also be brought to the notice of all the Organisations under the administrative control of the Ministries/Departments. 4. Appropriate necessary instructions on the subject may be issued by respective administrative Ministries/Departments in respect of Autonomous Bodies, Department of Public Enterprises in respect of Public Sector Enterprises, Ministry of Railways and Ministry of Defence in respect of the Services. 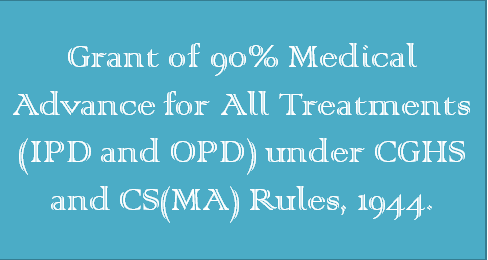 Grant of 90% Medical Advance for All Treatments (IPD and OPD) under CGHS and CS(MA) Rules, 1944. 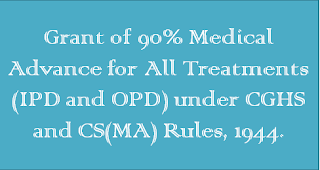 Subject: Grant of 90% medical advance for all treatments (IPD and OPD) under CGHS and CS(MA) Rules, 1944. The undersigned is directed to refer to O.M.NO.S. 14025/7/94-MS dated 15.05.1996, and OM No.S.12025/1/96-CGHS(P) dated 1305.1997 provisioning, inter-alia, grant of advance upto 90% in case of major illness like by-pass surgery, Kidney transplant, major cancer treatment, etc. 2. During the meeting held on 25.03.2015, National Council (Staff Side) requested this Ministry to make provisions for grant of 90% advance of the estimated cost for all treatments for serving Central Government employees, irrespective of major or minor diseases. 3. The matter was examined in the Ministry. Considering that the basic purpose of grant of advance for treatment of any disease is to provide relief to a Government employee from facing hardship, it has been decided with the approval of the competent authority that serving CS(MA) and CGHS beneficiaries may be granted 90% medical advance of the approved CGHS package rates for all indoor treatments, irrespective of major or minor diseases, on receipt of a certificate from the treating physician of a Government/recognized hospital as per the guidelines given in the OM No.S.14025/7/94-MS dated 15.05.1996 and OM No.S-11016/1/92-CGHS(P) dated 29.10.1992 for CS(MA) and CGHS beneficiaries respectively. 4. For out-door treatment, it has also been decided that advance may be limited to 90% of the total estimated expenditure of the treatment, subject to the condition that the advance for OPD treatment may only be granted when the total estimate of expenditure for OPD treatment including tests/investigations is more than Rs.10,000/-. 5. The advance should be released within 10 days on receipt of the request for advance by the administrative Department/Ministry/office in order to avoid inconvenience to the employees. 6. The OM No.S.12025/1/96-CGHS(P) dated 13.05.1997 stands withdrawn from the date of issue of this O.M. 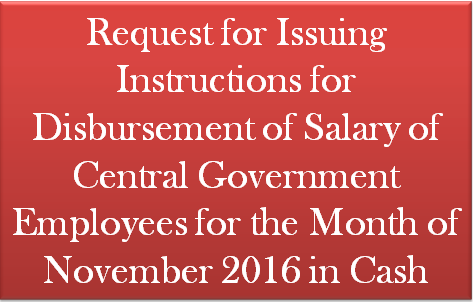 Sub: -Request for issuing instructions for disbursement of salary of Central Government Employees for the month of November 2016 in cash. As you are aware , the difficulties being experienced due to demonetization of Rs.500/- and Rs. 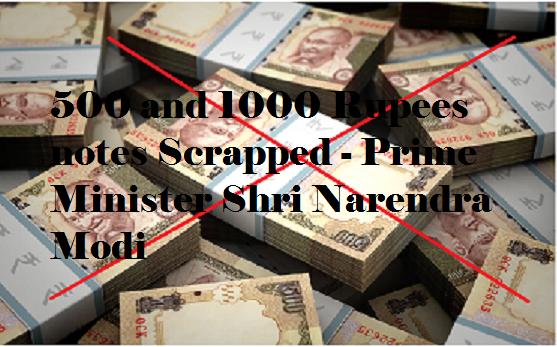 1000/- currency notes may continue for about 50 days as made clear by the Goverment. Further Banks have imposed a cap of 24000/- for withdrawal from savings Bank Accounts. Even for withdrawing that amount, one has to stand in long que for hours together. Naturally Central Government employees are likely to face much problem for getting their salary for this month in time. Employees waiting in que for cash may adversely affect the functioning of Central Goverment offices also. In view of the above situation, I request you to issue necessary instructions to all pay drawing and disbursing officers, to make advance arrangements for payment of salary for November 2016, in cash, to all Central Government employees, on or before 30th November 2016. Subject: Draft minutes of the meeting held on Tuesday the 25th October 2016, under the Chairmanship of Secretary (P) with the representatives of Staff Side, National Council (JCM) on issues relating to the DoPT- Specific Allowances. Please find enclosed a copy of the Draft Minutes of the meeting held under the Chairmanship of Secretary (P) on Tuesday the 25th October 2016 with the representatives of Staff Side on issues relating to the DoPT- Specific Allowances. You are requested to send your comments on the draft minutes by 15/11/2016 positively. RECORD NOTE OF THE DISCUSSION ON DOPT-SPECIFIC ALLOWANCES, HELD WITH THE STAFF-SIDE, NATIONAL COUNCIL (JCM) AT 3.00 P.M. ON 25.10.2016 UNDER THE CHAIRMANSHIP OF SECRETARY(P). A discussion on the DoPT-specific allowances with the Staff-Side National Council (JCM) was held at 3.00 p.m. on 25.10.2016 under the Chairmanship of Secretary(Personnel) in Room No. 119, North Block, New Delhi in compliance with the direction contained in the minutes of the 2nd meeting of the Committee on Allowances held on 01.09.2016 that every Ministry/Department should firm up its views/comments on allowances relating to the Ministry/Department after holding discussion with their Staff Associations. List of participants is at Annexure. At the outset JS(JCA) welcomed all the members of the Staff side of the National Council of JCM to the discussion on department specific allowances. JS(JCA) informed that in the second meeting of the Committee on Allowances it was decided that all the department specific allowances will be discussed with the JCM. 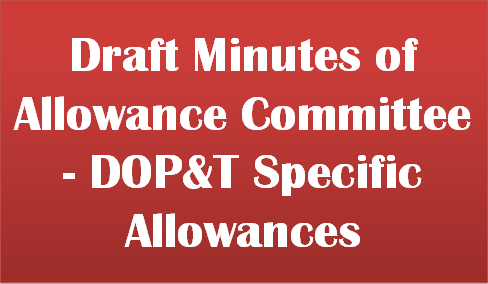 After a brief introduction it was decided to discuss the following department specific allowances on which DOPT has received the comments for Staff-Side. The Staff-Side has stated that the benefit of Children’s Education Allowance should be extended to the Graduate and Post Graduate levels also. They have informed that the private institutions are charging exorbitantly. So, subject to a ceiling on tuition fees and hostel fees, the CEA should be extended to the Graduates and Post Graduates level. Staff-Side has informed that they had also represented to the Pay Commission for simplifying the procedure wherein they had suggested that reimbursement should be based on the bonafide certificates from the schools where the children are studying. This suggestion has been accepted by the Pay Commission and the Staff-Side has requested that it should be implemented. On the issue of DOPT’s circular on e-receipt, Secretary, DoPT clarified that this circular had been issued before the government accepted the 7th Pay Commission recommendation. Staff-Side has pointed out that the Night Duty Allowance (NDA) is still being paid at the 4th CPC rate. Even though there is a Board of Arbitration award in favour of employees that from 01.01.1996 it should be given in the 5th CPC pay scale, the government did not accept the arbitration award and even today employees are getting it at the same rate as it was prevalent during the 4th CPC period. In the Ministry of Defence a lot of litigation had taken place and the matter went up to the Supreme Court. Hon’ble Supreme Court directed that it should be paid on the basis of the actual pay drawn and that NDA should be revised w.e.f. 01.04.2007 at the 6th CPC pay scale which has been implemented by the government. However, the audit authorities came up with an objection that there is a ceiling for it which has been objected to by the Staff-Side. Apart from that, the 7th Pay Commission has recommended that it should be worked out with the actual pay of the employee being the criterion. However, in spite of that, except for the Ministries of Defence and Railways, employees working in other Ministries/Departments are getting it at 4th CPC rate. Thus, the absence of uniformity on this allowance across Ministries/Departments is very glaring which, according to the Staff-Side, is a principal source of litigation and will continue to remain so. Therefore, the Staff-Side has suggested that an early revision of the NDA without ceiling, and on the basis of the actual basic pay, and extending it to whoever is asked to do night duty will go a long way in reducing litigations in the future. Staff-Side has pointed out that there are two types of over time duty. One is covered under the Factories Act, 1948, and the other is for the office staff. In the first case, since it is a statutory obligation, the Pay Commission has not recommended anything on it. But for those Central Government employees who are not covered under the statutory provisions of the Factories Act, OTA is paid at a single rate of Rs.15.85/- only and, that too, for the first hour immediately after the scheduled office closing time, it is Nil. 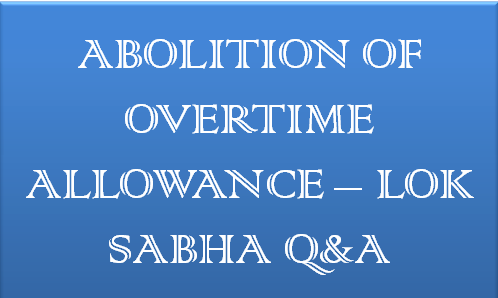 In case of OTA there is also an arbitration aw-ld from 01.01.1996 that it should be at par with the 5th CPC pay scale. However, neither it has been implemented nor have the rates been revised. Staff-Side has informed that the 7th CPC recommendation on its abolition is based on the fact that in most of the offices today salary disbursement is not made in cash. It is credited to the individual bank accounts. But cash transactions do take place in certain offices like the Post Offices where cash handouts are made under the Mahatma Gandhi National Rural Employment Guarantee Act. PLI is also another example. Therefore, if it is stopped all of a sudden, no person will show interest in working as cashiers and take the additional responsibility of handling huge amounts of cash. Therefore, the Staff-Side has contended that till all cash transactions are eliminated, CHA should continue. It was also pointed out by them that this allowance depends on the amount of cash transaction; when the volume of cash transaction comes down, the allowance will also proportionately come down. Staff-Side has informed that the 7th Pay Commission has recommended that Persons Below Officers Rank (PBOR) should be given Dress Allowance @ Rs.10,000/- per month. There are 5 Ordnance Factories under Ministry of Defence where persons are exclusively deployed to produce special high altitude dresses for the combat forces of the army. 12000 employees are working in these 5 factories. Therefore, if a uniform rate like this is maintained, it will have an adverse impact on the quality of these high altitude uniforms and will thus jeopardise the safety of the armymen and the nation as a whole. Staff-Side is stated to have already made a request to M /o Defence not to implement this recommendation. Army has also taken a stand that this will result in substandard or sub quality material. So this recommendation on the Dress allowance for PBOR should not be implemented. It has also been pointed out that there are many categories like canteen employees, security staff, chowkidars which have not been mentioned and who are eligible for uniform or uniform allowances. It has to be clarified whether these categories will be covered under ‘others’. Staff-Side has stated that whosoever is getting Dress Allowance as on today should continue to get that. Staff-Side has also informed that the recommendations on Dress Allowance have created a lot of discrimination among staff working in similar circumstances. Staff-Side has also drawn attention to the Dress Allowance with respect to the Nursing Staff. It has been stated that earlier also Nursing Staff were not given normal washing allowance or dress allowance considering the importance or the peculiar conditions prevailing in hospitals. Now they have also been bracketed in the general category. They were getting Rs.750 as Uniform Allowance and Rs. 450 as Washing Allowance per month. Now there is no separate category that has been given to them. For them a different dispensation was made taking into account their special requirements because they work in such an environment where their uniforms require regular washing entailing a substantial expenditure. As these have not been accounted for in the 7th CPC, the nursing staff should have a special dispensation, as is strongly felt by the Staff-Side. JS (JCA) has requested Staff-Side to submit a note on the justification or break-up of the amount of Rs.32,400(maximum) as suggested by them and the Staff-Side has agreed to provide the same. Secretary, DOPT summed up the demands of the Staff-Side by observing that those who were getting Dress Allowances, their allowances should not come down. And the categories of the employees which had special dispensation in the past and have not been mentioned this time or have been clubbed together with other categories need clarification. The Staff-Side has informed that Ministry of Defence is engaged in arms and ammunitions manufacturing etc. In the process of manufacturing them, the staff engaged for this purpose, have to handle hazardous chemicals, acids and so many other poisonous combinations. Cabinet has approved 45 risk operations pertaining to Defence civilian employees. Apart from that, because of the technological developments taking place fast and as the requirement of the armed forces is increasing for getting modern equipments, ammunitions and explosives, new risk operations have also come into existence of which Ministry of Defence is aware and have recommended also accordingly. In spite of this, the existing Risk Allowance has been abolished by the Pay Commission. It has been pointed out by the Staff- Side that it has not been subsumed under the risk and hardship matrix. Rather it comes in the abolition list. In no matrix are the risk operations of Defence civilians are covered. Staff-Side has informed that they have discussed this with Defence Secretary and Defence Ministry is going to recommend in favour of its inclusion in one of the matrix. In response to the query of Secretary, DOPT as to whether the activities which have been considered to be risky have all been identified, Staff-Side has clarified that it has been identified by a high level committee and approved by the Cabinet. 45 risk operations have been identified and approved. But within a period of 2 decades, lot of new ammunitions and new explosives have come in the arsenal, alongwith a lot of hazardous chemicals and acids. So, M/o Defence has again appointed a committee and they have identified that all these are additional risk operations over and above the 45 identified, where Defence Civilian employees are actively involved. But the Pay Commission has abolished Risk Allowance. So this has to be incorporated in one of the risk matrix. Staff-Side has pointed out that in the 7th CPC report it has been stated that any allowance not mentioned and hence not reported to the Commission shall cease to exist immediately. They have requested that this recommendation should be rejected. On the contrary, the administrative Ministries should come forward and recommend for their abolition or retention. Staff-Side has also stated that 7th CPC has abolished all advances completely. Noting that we regularly celebrate a number of festivals like Diwali, Holi, Eid and keeping the general sentiment in mind, they are of the view that advances are very necessary. Moreover, these advances are required to be paid back to the government. On Family Planning Allowance, the Staff-Side has stated that since the Government has not changed its Family Planning policy, the allowance should be continued. At least in the case of those people who were getting it they should continue to get as they have fulfilled all conditions when the allowance was granted. Otherwise there will be drop in their emoluments. 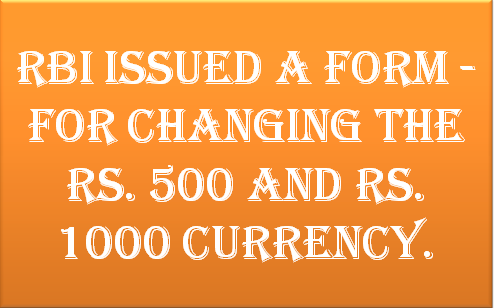 RBI Issued a Form - for Changing the Rs. 500 and Rs. 1000 Currency. In a historical move that will add record strength in the fight against corruption, black money, money laundering, terrorism and financing of terrorists as well as counterfeit notes, the Government of India has decided that the five hundred and one thousand rupee notes will no longer be legal tender from midnight, 8th November 2016. The Government has accepted the recommendations of the RBI to issue Two thousand rupee notes and new notes of Five hundred rupees will also be placed in circulation. Notes of one hundred, fifty, twenty, ten, five, two and one rupee will remain legal tender and will remain unaffected by the decision today. Prime Minister Shri Narendra Modi made these important announcements during a televised address to the nation on the evening of Tuesday 8th November 2016. He said that these decisions will fully protect the interests of honest and hard-working citizens of India and that those five hundred and one thousand rupee notes hoarded by anti-national and anti-social elements will become worthless pieces of paper. The Prime Minister said the steps taken by the Government would strengthen the hands of the common citizens in the fight against corruption, black money and counterfeit notes. Fully sensitive to some of the difficulties the common citizens may face in the coming days, the Prime Minister has announced a series of steps that will help overcome the potential problems. 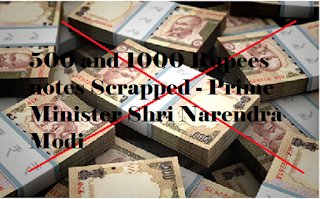 Persons holding old notes of five hundred or one thousand rupees can deposit these notes in bank or post offices from 10th November onwards till 30th December, the Prime Minister announced. There are also some limits placed on the withdrawals from ATMs and bank for the very short run. Shri Modi stated that on humanitarian grounds notes of five hundred and one thousand rupees will be accepted at government hospitals, pharmacies in government hospitals (with prescription of a doctor), booking counters for railway tickets, government buses, airline ticket counters, petrol, diesel and gas stations of PSU oil companies, consumer cooperative stores authorized by the state or central government, milk booths authorized by state government and crematoria, burial grounds. Shri Modi emphasized that there is no restriction on any kind of non-cash payments by cheques, demand drafts, debit or credit cards and electronic fund transfer. In his address the Prime Minister shared the insight into how the magnitude of cash in circulation is linked to inflation and how the inflation situation is worsened due to the cash deployed through corrupt means. The Prime Minister added that it adversely affects the poor and the neo-middle class people. He cited the example of the problems being faced by the honest citizens while buying houses. The Prime Minister has time and again said that the Government is committed to ensure that the menace of black money is overcome. Over the past two and a half years of the NDA Government, he has walked the talk and led by example. The very first decision of the Prime Minister led NDA government was the formation of a SIT on black money. A law was passed in 2015 on disclosure of foreign bank accounts. In August 2016 strict rules were put in place to curtail benami transactions. 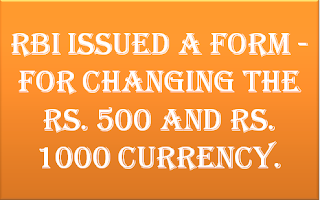 During the same period a scheme to declare black money was introduced. The efforts have borne fruit. Over the past two and a half years, more than Rs. 1.25 lakh crore of black money has been brought into the open. Prime Minister Narendra Modi has time and again raised the issue of black money at the global forum, including at important multilateral summits and in bilateral meetings with leaders. The Prime Minister said that the efforts of the Government have led to India emerging as a bright spot in the global economy. India is a preferred destination for investment and India is also an easier place to do business in. Leading financial agencies have shared their optimism about India’s growth as well. Combined with this, Indian enterprise and innovation has received a fillip due to the ‘Make in India’, ‘Start up India’ and ‘Stand up India’ initiatives that seek to celebrate enterprise, innovation and research in India. The historic announcements made by the Prime Minister will add value to the already thriving efforts of the Central Government. New Delhi — 110 055. Sub. 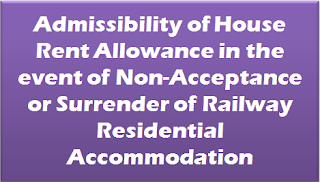 :- Admissibility of House Rent Allowance in the event of non-acceptance or surrender of railway residential accommodation —reg. Ref. :- 1. NFIR’s letter No. 1/5(c )/Part I dated 22/02/2016. 2. NFIR’s letter No. 1/5(c )/Part I dated 25/04/2016. I am directed to refer to your letters quoted above. The subject item (No. 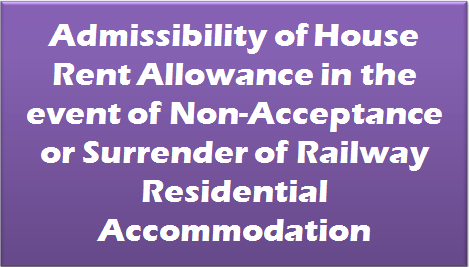 40/2012) refers to admissibility of HRA in the event of non-acceptance or surrender of Railway residential accommodation. While this is governed by Railway Board’s letter No. E(P&A)-II/99/HRA-2 dated 16/03/2000; the Federation vide their letter No. 1/5(c) Pt. I dated 09/04/2012 had asked for review of the clause mentioned in Board’s letter ibid that HRA will not be admissible to railway employees for whom railway accommodation is specifically earmarked or to those employees, whose occupation of railway quarters is essential for easy accessibility during emergencies and efficient discharge of their duties etc. (“essential staff’). 2. Subsequently, as recorded in the PNM meeting held on 30-31 January, 2014, it was explained to the Federation that wherever there is a house earmarked the employee cannot be allowed HRA. Federation contended that administration cannot deny HRA when earmarked quarters are not fit for occupation and wanted that a clarification be issued in the matter. 3. The item was further discussed by the Federation with the Board on 15/07/2015 and it was recorded as “As decided in the earlier meeting, a clarification after reviewing the matter is to be issued. Official Side stated that they propose to issue instructions in consultation with Civil Engineering Directorate. Federation stated that while they do not understand the need for a consultation with the Civil Engineering in this case, they requested the clarification be issued quickly. It was agreed to do so. The item to be closed thereafter” . 4. Accordingly, the matter had seen referred to Land & Amenties Dte. who confirmed that instructions were in place (issued vide RB/L&A No. 009/2011 dated 19/09/2011 to all Zonal Railway, PUs etc.) regarding dismantling of condemned/abandoned quarters, and that quarters declared condemned are not made available for allotment. 5. In line with the assurance recorded at para 3 above, letter No. E(P&A)- II/2012/F.E.2/4 dated 12/10/2015 was issued to all Zonal Railway and Production Units etc. that before allotment of Railway quarters, it should be ensured that such quarters are fit for occupation. Copy of this letter was also endorsed to the Federation. 6. It is, therefore, submitted that the letter dated 12/10/2015 referred to had already been issued by the time minutes of the discussions on the item held with NFIR on 8th and 9th October, 2015 were finalized/received and this was also explained in the meeting with NFIR in 18/01/2016. There has, therefore, been no deliberate violation of the assurance given to the Federation. 7. As, in terms of extant instructions, quarters unfit for occupation are not to be allotted, the question of allowing HRA against such allotment does not arise, in general. Any violation of the extant instructions can be taken up with the concerned field formation for appropriate remedial action. 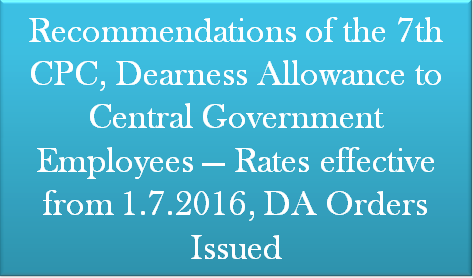 Subject: Recommendations of the Seventh Central Pay Commission — Decision of Government relating to grant of Dearness Allowance to Central Government employees — Rates effective from 1.7.2016. The undersigned is directed to say that consequent upon decision taken by the Government on the recommendations of the Seventh Central Pay Commission relating to Dearness Allowance, the President is pleased decide that the Dearness Allowance (DA) to all categories of Central Government employees shall be admissible at rate of 2 percent of basic pay per month, w.e.f.01.07.2016. 2. 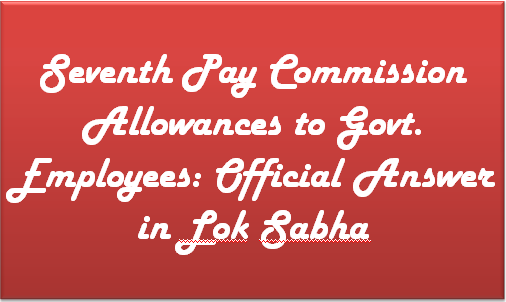 The revised pay structure effective from 01.01.2016 includes the Dearness Allowance of 125% sanctioned from in the pre-revised pay structure. 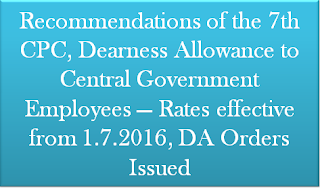 Thus, Dearness Allowance in the revised pay structure shall be zero from 01.01.2016. 3. The term ‘basic pay’ in the revised pay structure means the pay drawn in the prescribed Level in the Pay Matrix but does not include any other type of pay like special pay. etc. 4. The Government vide Resolution No.1-2/2016-IC, dated 25/07/2016 has decided that till a final decision Allowances is taken based on the recommendations of the Committee constituted under the Chairmanship of Finance Secretary & Secretary (Expenditure), all Allowances will continue to be paid at existing rates. 5. 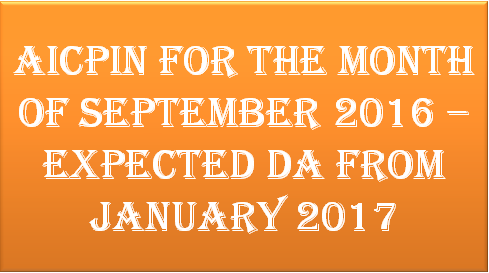 The Dearness Allowance will continue be a distinct element of remuneration and will not be treated as pay with in the ambit of FR 9(21). 6. The payment on account or Dearness Allowance involving fractions of 50 paise and above may be rounded to the next higher rupee and the fractions of less than 50 paise may be ignored. 7. These orders shall also apply to the civilian employees paid from the Defence Services Estimates and the expenditure will be chargeable to the relevant head of the Defence Services Estimates. In respect of Armed Forces personnel ard Railway employees, separate orders will be issued by the Ministry of Defence and Ministry of Raiways, respectively. 8. In so far as the employees working in the ‘Indian Audit and Accounts Department are concerned, these orders are issued in consultation with the Comptroller and Auditor General of India. 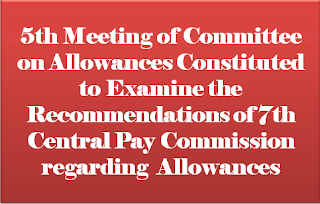 Sub : 5th Meeting of Committee on Allowances constituted to examine the recommendations of 7th Central Pay Commission regarding Allowances. The 5th Meeting of the Committee on Allowances is scheduled to be held on 3rd November 2016 at 5.00 PM in Room No. 72, North Block, New Delhi under the Chairmanship of Finance Secretary & Secretary (Expenditure). During the meeting the allowances relating to Department of Posts will be discussed. 2. In this context, the Implementation Cell, Department of Expenditure has requested to send the names of members of such recognized Associations who will present their views on the allowances recommended by the 7th CPC relating to Department of Posts in the meeting to be held on 03.11.2016. Accordingly, it has been decided to invite General Secretaries of all three federations to attend the said meeting. 3. It is therefore requested to kindly attend the 5th Meeting as scheduled on 03.11.2016 on allowances relating to Department of Posts. 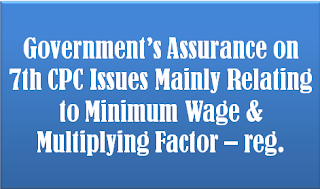 Government’s Assurance on 7th CPC Issues Mainly Relating to Minimum Wage & Multiplying Factor – reg. 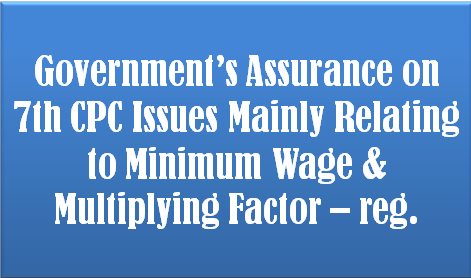 Sub: Government’s assurance on 7th CPC issues mainly relating to Minimum Wage & Multiplying Factor – reg. I seek you valuable time through this letter and place the following for kind consideration and immediate action. The Central Government employees in general and Railway employees in particular were extremely upset over the retrograde recommendations of 7th Central Pay Commission, particularly the recommendations relating to Minimum Wage and Multiplying Factor. In the wake of Indefinite Strike decision on Charter of demands of NC/JCM Constituent Organizations (Railways, Defence, Postal Confederation etc)., the Group of Ministers held meetings with JCM (Staff Side) leaders on 30th June 2016 & 06th July 2016 and consequently assurance was given that a High Level Committee will examine 7th CPC issues mainly Minimum Wage and Multiplying Factor. On this assurance, JCM Constituent organizations have deferred Strike action on 06th July, 2016. Though a Committee was constituted under the chairmanship of Addl. Secretary (Exp), Ministry of Finance and discussions held, the response has been disappointing. The employees of Railways and other Central Government departments are greatly disappointed over non-settlement of main issues through discussions. May I request your kind attention in the matter for implementation of assurance given by Group of Ministers for the revision of Minimum Wage & Multiplying Factor through discussions with NC/JCM (Staff Side) very early. The All-India CPI-IW for September, 2016 decreased by 1 point and stood at 277 (two hundred and seventy seven). On 1-month percentage change, it decreased by (-) 0.36 per cent between August 2016 and September, 2016 when compared with the increase of (+) 0.76 per cent between the same two months a year ago. At centre level, Belgaum, Rajkot, Mumbai and Ahmedabad reported the maximum decrease of 4 points each followed by Ludhiana, Madurai, Agra, Chennai, Warrangal, Bhilwara and Surat (3 points each). Among others, 2 points decrease was observed in 12 centres and 1 point in 18 centres. On the contrary, Angul-Talcher recorded a maximum increase of 7 points followed by Howarah and Amritsar (3 points each). Among others, 2 points increase was observed in 8 centres and 1 point in 7 centres. Rest of the 19 centres’ indices remained stationary. The indices of 33 centres are above All-India Index and other 41 centres’ indices are below national average. The indices of Jabalpur, Lucknow, Pune and Bhopal centres remained at par with All-India Index.